This noodle dish is typical of Cantonese home cooking. 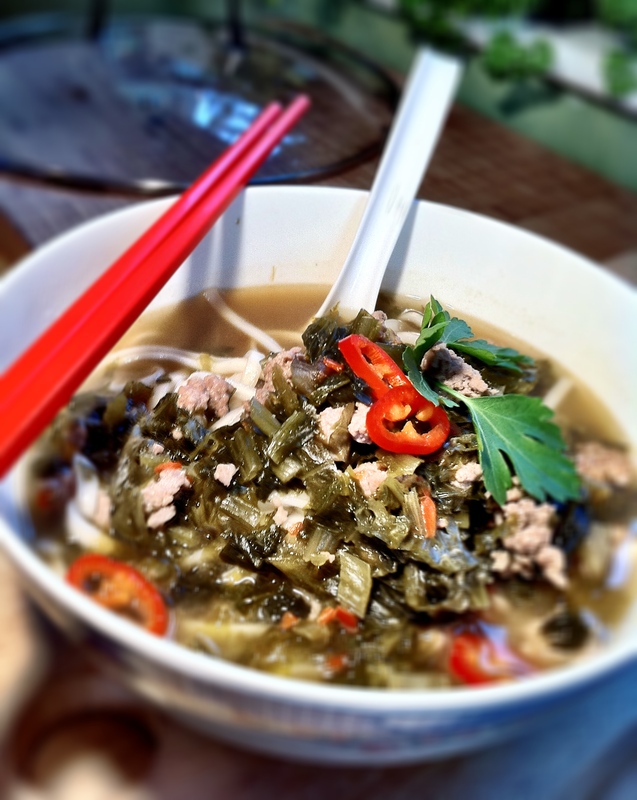 The flavour of this noodle soup is both delicate yet distinctive – the snow cabbage is braised and not pickled so adds lots of tangy undertones to the broth without making it sour. I’ve de-seeded the chilli I’ve put in but if you like your dishes spicy and hot, leave the seeds in. 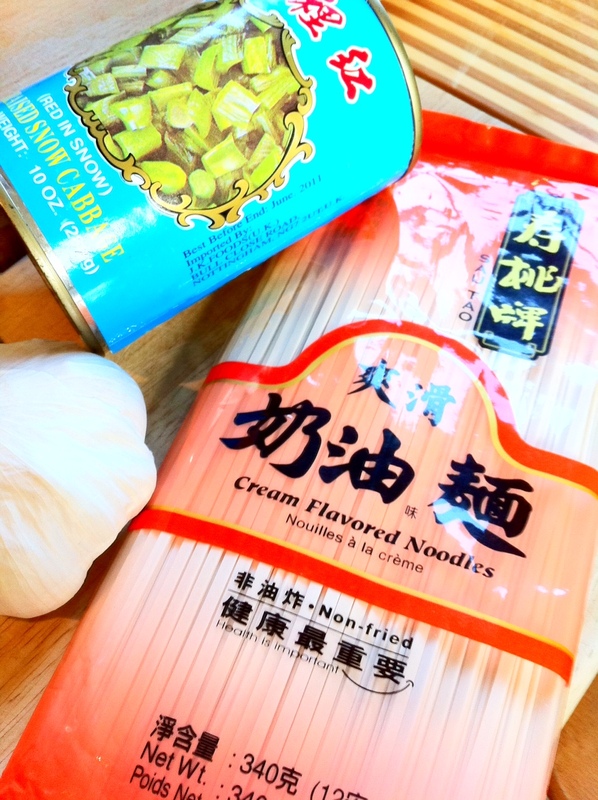 The two essential ingredients that you’ll only be able to find in a Chinese grocery store are dried cream noodles (or shanghai noodles), and tinned (braised) snow cabbage. Here’s what they typically look like. You’ll need 2 saucepans – one to make the soup and the other for cooking the noodles. Marinate the minced pork with the soy, xiaoxing wine and oyster. Set aside. Fill one saucepan with enough water to cook the noodles and set it to boil. The cream noodles normally take about 5 minutes to cook so as soon as the water’s boiled, heat the other saucepan because by the time the noodles cook, your soup broth will be done! In the other saucepan, heat the vegetable oil. Once it’s hot, stir fry the garlic and chopped chilli until the garlic starts turning brown. Add the minced pork and stir fry until the pork is cooked through and starts to brown a little (about 2-3 minutes). At this time, make sure you’ve also boiled the 8 cups of water already (roughly a full kettle’s worth). Put your cream noodles into the boiling water and give it a good stir to make sure none of the noodles stick together. 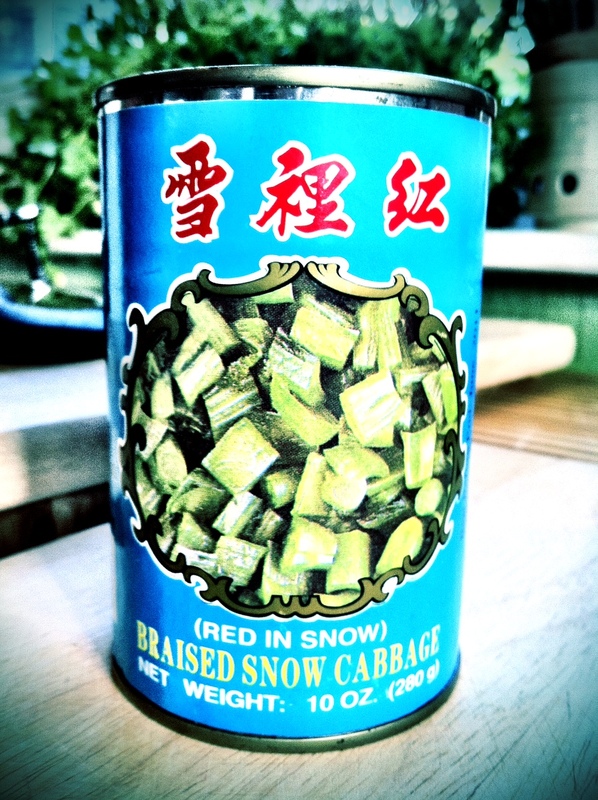 Add the braised snow cabbage to the pork (including the braising liquor), mix well and add in the 8 cups of boiling water. Add the 2 teaspoons of chicken powder (or you can also use vegetable powder or pork stock cubes). Season with salt and a few generous grinds of white pepper. On medium heat, allow the soup to simmer.